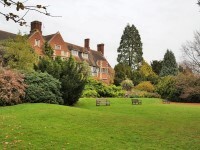 Services / facilities within the grounds include various different planted floral gardens, greenhouses and a sunken garden, plus an arboretum. 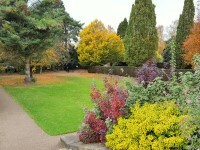 The Botanic Garden is located in Oadby, at the junction of the outer ring road (A563) with the A6. Glebe Road leads off the A6 next to this junction. 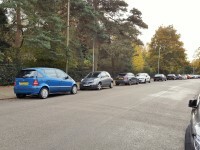 Visitors can park on Glebe Road outside the entrance. 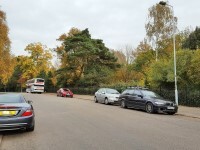 Bus routes 31, 31A, 80 and 80A run from the railway station and city centre, and stop on Leicester Road, close to the junction with Glebe Road. Leicester Station is located on the south side of the City Centre, just off the Inner Ring Road. Leicester is on the London - Sheffield and the Birmingham - Stansted lines. 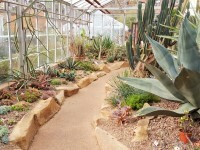 For more information about getting to the garden, please see the How To Get Here page on the Botanic Garden website. 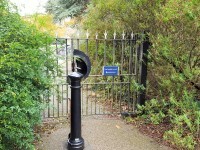 General on street parking is available on Glebe Road, outside the entrance to the garden. 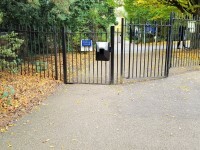 This information is for the entrance located off Glebe Road. 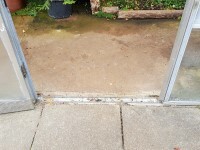 The width of the door opening is 350cm (11ft 6in). 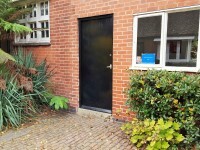 The width of the door opening is 113cm (3ft 8in). 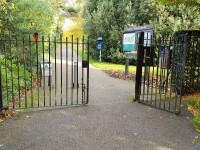 The second set of doors is actually a gate, located to the left after you pass through the first entrance. 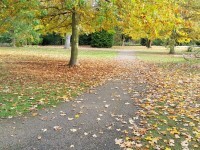 You are on Paths Through the Garden. Skip to the next section. 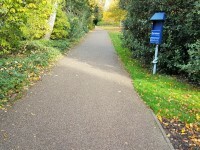 The paths are mainly tarmac, with some compacted gravel and some flagstone surface paths. 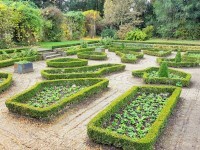 There are also some unsurfaced areas of the garden. 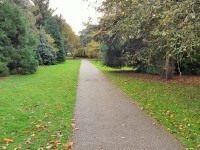 The paths have an easy gradient although some in the arboretum area of south east corner can be steep and dragging (photographs 5 and 6). 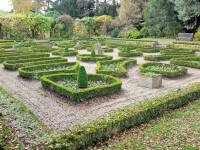 Photograph 8 show the sunken garden in the north west corner of the garden. 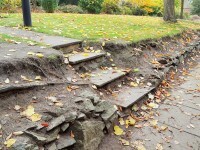 The sunken area can only be accessed by 3 medium steps with no handrails. 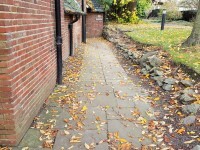 You are on Level Change (To The Side of Beaumont House). Skip to the next section. 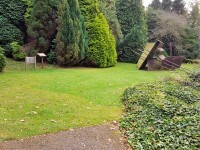 The ramp/slope is located in the north east corner of the garden. 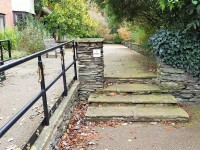 The ramp or steps here are used to continue on the path around the very north east corner of the garden, and also the exit by Beaumont House. 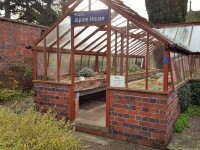 You are on Entrance (Alpine House). Skip to the next section. 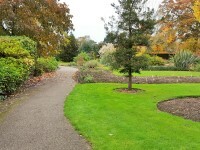 This information is for the entrance located just off the path leading around the side of The Knoll, in the centre of the garden. 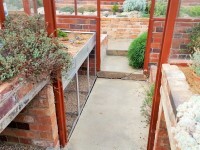 There are a further 2 sets of medium steps inside this greenhouse (photograph 3). 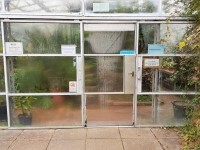 There is a similar door to exit the greenhouse, with 2 steps (shown in photograph 4). 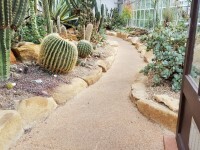 You are on Entrance (Desert House). Skip to the next section. 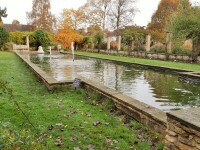 This information is for the entrance located on the far north side of the garden. 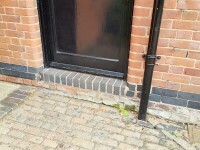 The width of the door opening is 99cm (3ft 3in). 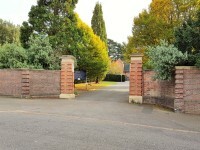 You are on Entrance (Mediterranean House). Skip to the next section. This information is for the entrance located on the eastern side of the garden, by Hastings House. 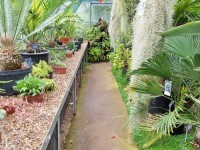 You are on Opening Times (Greenhouses). Skip to the next section. 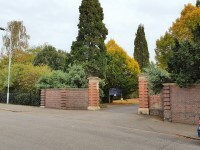 You are on Entrance (Classrooms). Skip to the next section. This information is for the entrance located at the rear of Hastings House, towards the south east corner of the garden. 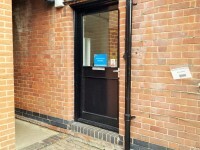 There are two classrooms here, a seminar room (photographs 1 and 2) and a lab (photographs 3 and 4). 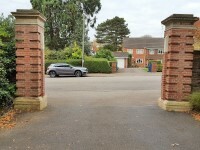 The entrances are the same to both. 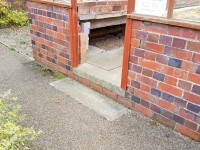 Access from the main path around the garden to these entrances is via a gate, 86cm wide and permanently held open, and a shallow step (shown in photograph 5). 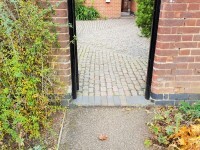 The courtyard area between this gate and the rooms has a cobbled surface (photograph 6). 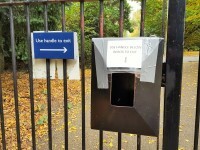 You are on Outside Access (Exit). Skip to the next section. 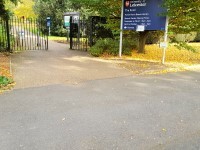 This information is for the entrance located off Glebe Road opposite the second gate at the main entrance. 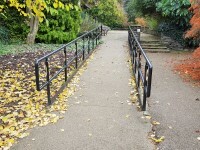 The ramp/slope is located leading to and beyond the exit. 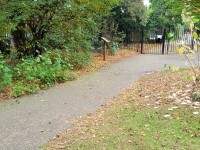 After this gate, turn left and exit the first entrance back onto Glebe Road (shown in photograph 5). 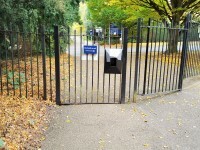 The handle to open this gate is located in a box on the gate (shown in photograph 3). The opening to this box is 80cm - 94cm high, so may not be accessible to all. 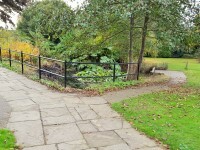 There is an exit located in the north east corner of the garden by Beaumont Hall (shown in photograph 6). 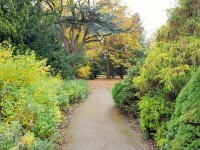 Visitors are also welcome to exit the garden via the main entrance. 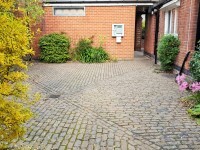 This accessible toilet is approximately 150m (164yd 2in) from the main entrance. 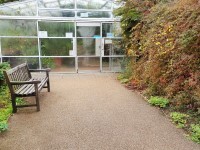 This accessible toilet is located within the toilet block at the rear of The Knoll, in the centre of the garden. 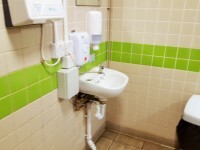 The dimensions of the accessible toilet are 152cm x 203cm (4ft 12in x 6ft 8in). There is not an emergency pull cord alarm in the cubicle. The cubicle also contains a baby change table, which is 89cm high when extended. 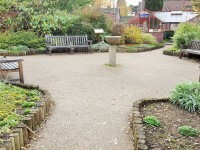 There are male and female toilets located in the toilet block in the centre of the garden. 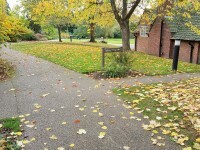 There are shared toilets located next to the classrooms by Hastings House, towards the south east of the garden. 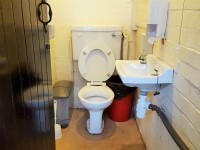 The toilet surveyed is located in the toilet block. 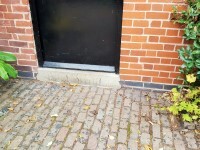 The standard toilet surveyed is approximately 150m from the main entrance. 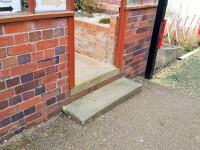 The shared toilets are accessed by 2 medium steps only (shown in photograph 4). 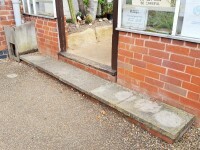 You are on Level Change (Access To The Toilet Block). Skip to the next section. 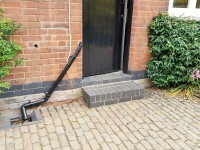 The ramp/slope is located leading around the block to the toilets. 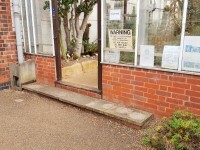 The width of the ramp/slope is 119cm (3ft 11in). 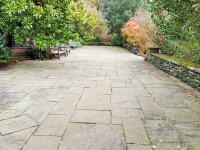 The step(s) is/are located leading off the main path through the garden to the block.